Climate change is a critical global environmental challenge facing humanity with implications for food production, natural ecosystems, freshwater supply, health, and other conditions. According to the recent scientific assessment of the Intergovernmental Panel on Climate Change (IPCC), the Earth's climate system has demonstrably changed on both global and regional scales since the preindustrial era (Watson et al. 2001). Further, there is evidence to show that most of the warming (of 0.1°C per decade) observed over the past 50 years is attributable to human activities. The IPCC projects that the global mean temperature is likely to increase between 1.4 and 5.8°C by 2100. This unprecedented increase is expected to have severe impacts on the global hydrological system, ecosystems, sea level, crop production, and related processes. Fossil-fuel combustion is the primary contributor to the formation of carbon dioxide, which accounts for about 72 percent of the temperature increase to 2100. Methane and nitrous oxide are the two other large contributors to the increase. Aerosols, ozone, and other gases tend to ameliorate the impact of the gases mentioned, but these effects are not as well understood. Fossil-fuel combustion released about 6.3 ± 0.3 petagrams of carbon per year (PgC y-1), and emissions from land use change amounted to 1.6 ± 0.8 PgC y-1 during 1989-98 (Watson et al. 2000). Terrestrial sinks captured 0.7 ± 1.0 PgC y-1 over the same period. The impact of carbon and other greenhouse gases (GHGs) is cumulative, and hence it is important to examine both the current and past history of emissions and sinks in order to understand the full consequences of the contribution of these gases to climate change. Figure 22.1. Actual per capita CO2 emissions and per capita CO2 emissions indexed to the ratio of 1971 GDP (1990 US$1,000 purchasing power parity) to 1971 CO2 emissions for selected countries. t C = tons of carbon. Japan, the United States, and other countries of the Organisation for Economic Cooperation and Development (OECD) has increased far slower than economic growth (Figure 22.1). China, too, has made significant gains, and its energy growth rate has been half that of its gross domestic product (GDP) growth rate since the early 1980s. Can similar trends continue in the future and not only slow but reverse the growth of energy use and consequent carbon emissions? To what extent do such trends need to continue in order to stabilize atmospheric GHG concentrations? Are technologies available to achieve near-term GHG emissions reduction and long-term stabilization? How much might these cost? I rely on the IPCC Third Assessment Report and other more recent reference materials to address these questions. Mitigation options may be characterized by the sectors and GHGs they are intended to address. I focus below on carbon dioxide and methane, the two largest contributors to GHG concentrations. Many cost-effective technical strategies for greenhouse gas abatement have been identified for the energy sector. These options can be classified into two categories—improving energy efficiency and switching to less-carbon-intensive or carbon-neutral fuels. Improving energy efficiency reduces the energy used without reducing the level of service. Reduced energy use decreases associated environmental impacts, including emissions of greenhouse gases. Among fossil fuels, carbon content decreases from coal to oil to natural gas. Switching to less-carbon-intensive fuels is a viable strategy to reduce GHG emissions. Renewable energy sources such as wind, solar energy, and nuclear energy have no direct carbon content. Hydroelectric sources, however, may release CO2 and methane, depending on the reservoir surface area and seasonal changes in the water depth, type of vegetation, and soils beneath their reservoirs (Fearnside 1997). The forestry sector mitigation activities can be broadly categorized into three groups—forest carbon conservation and management measures; carbon storage management (expanding forest carbon sinks); and fossil-fuel substitution and management activities (Brown et al. 1996). Mitigation activities include conventional forest conservation, afforestation, and reforestation as well as modern activities such as substituting fossil fuels with bioenergy, fire protection techniques, reduced-impact logging practices, and recycling of forest products. Improved crop and soil management can increase carbon levels in the currently cropped lands and reduce losses from newly cropped lands. 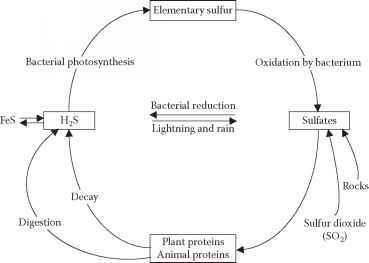 Thus, altering management of agricultural soils, adopting new land use and management practices, and restoring degraded agricultural lands are potential measures to sequester atmospheric carbon and reduce greenhouse gas emissions. Methane is expected to contribute about 24 percent of the total projected global warming over the next 100 years. The sources of methane in agriculture are enteric fermentation in ruminants, flooded rice fields, and anaerobic animal waste processing (Robertson, Chapter 29, this volume). Enteric fermentation in cattle and rice cultivation account for 31 and 12 percent of global methane emissions, respectively. Mitigation options to reduce carbon dioxide emissions from the energy sector have received the most attention in both technology characterization and global modeling studies to date. Only recently, options that address methane, nitrous oxide, chloroflu-orcarbons, and other GHGs are being examined in models of the global economy.1 The inclusion of biological and engineered sinks is yet to be explicitly considered in such models. One of the challenges to the inclusion of biological sinks in these models lies in their temporal dimension. Sinks accumulate carbon relatively slowly. Carbon releases from them can be either slow or rapid. The timing of monetary flows is very different from those of biological carbon. Biological sinks may release carbon in response to a warming climate or natural or other disturbances, and these disturbances would need to be carefully accounted. Most reductions are available at negative net direct costs. Most studies indicate net direct costs less than US$25/tC but two suggest net direct costs will exceed US$50/tC. More than half available at net negative direct costs. Costs are uncertain. N2O emissions reduction costs are US$0-$10/tCe . Most reductions will cost between US$0 and US$100/tCe with limited opportunities for negative net direct cost options. About half of reductions due to difference in study baseline and SRES baseline values. Remaining half of the reductions available at net direct costs below $200/tC . Limited net negative direct cost options exist; many options are available for less than $100/tCeq. aBuildings include appliances, buildings, and the building shell. bThe range for agriculture is mainly caused by large uncertainties about CH4, N2O, and soil-related emissions of CO2. Waste is dominated by methane landfill, and the other sectors could be estimated with more precision as they are dominated by fossil CO2. cIncluded in sector values above. Reductions include electricity generation options only (fuel switching to gas/nuclear, CO2 capture and storage, improved power station efficiencies, and renewables). dTotal includes all sectors reviewed in Chapter 3 for all six gases. It excludes non-energy-related sources of CO2 (cement production, 160 MtC; gas flaring, 60 MtC; and land use change, 600—1,400 MtC) and energy used for conversion of fuels in the end-use sector totals (630 MtC). If petroleum refining and coke oven gas were added, global 1990 CO2 emissions of 7,100 MtC would increase by 12 percent. Note that forestry emissions and their carbon sink mitigation options are not included. 'The baseline SRES scenarios (for six gases included in the Kyoto Protocol) project a range of emissions of 11,500—14,000 MtCeq for 2010 and of 12,000 — 16,000 MtCeq for 2020. The emissions reduction estimates are most compatible with baseline emissions trends in the SRES-B2 scenario. The potential reductions take into account regular turnover of capital stock. They are not limited to cost-effective options but exclude options with costs greater than US$100/tCeq (except for Montreal Protocol gases) or options that will not be adopted through the use of generally accepted policies. belowground biomass. Excludes carbon in soils and in dead organic matter. deforestation is very uncertain for the tropics and could be in error by as much as ±50%. practices for each land use and climatic zone. aSource: SRLUCF Table SPM-3 (Watson et al. 2000). Based on IPCC definitional scenario. Information is not available for other definitional scenarios. "Potential" refers to the estimated average stock change (MtC). bSource: SRLUCF Table SPM-3 (Watson et al. 2000). Based on IPCC definitional scenario. Information is not available for other definitional scenarios. "Potential" refers to the estimated range of accounted average stock change 2008-2012 (MtC/y-1). cSource: SRLUCF Table SPM-4 (Watson et al. 2000). "Potential" refers to the estimated net change in carbon stocks in 2010 (MtC/y-1). The list of activities is not exclusive or complete, and it is unlikely that all countries will apply all activities. Some of these estimates reflect considerable uncertainty. (Watson et al. 2001). These estimates were based on bottom-up engineering approaches that examined the cost and potential of a set of technical options in each of the sectors identified in the tables. The potential reductions in Columns 4 and 5 ofTable 22.1 can be compared with 1990 emissions in Column 2. Thus, for the buildings sector, the reduction potential is 0.70-0.75 PgCeq y-1 in 2010, or 42-45 percent, of the historical emissions of 1.65 PgCeq y-1 in 1990. The total reduction potential increases to 1.9-2.6 PgCeq y-1 by 2020. In principle, this is more than enough to meet the Kyoto Protocol target of 5.2 percent. The cost of achieving this reduction is relatively low (Table 22.1, Column 6). About half of the potential emissions reductions identified in the table can be achieved with direct benefits exceeding direct costs, and the other half at a net direct cost of up to US$100/t Ceq (at 1998 prices).2 Depending on the emissions scenario, this could allow global emissions to be reduced below 2000 levels in 2010-2020, at these net direct costs. The realized potential, however, is likely to be lower, owing to unaccounted implementation costs and barriers to project implementation. Forests, agricultural lands, and other terrestrial ecosystems offer significant carbon mitigation potential as well. Conservation and sequestration of carbon, although not necessarily permanent, may allow time for other options to be further developed and implemented. The potential of biological mitigation options is on the order of 1.202— 1.589 PgC y-1 of emissions reductions by 2010 (Table 22.2), and 100 PgC (cumulative) by 2050, equivalent to about 10 to 20 percent of projected fossil-fuel emissions during that period. There are substantial uncertainties associated with this estimate (Watson et al. 2001). 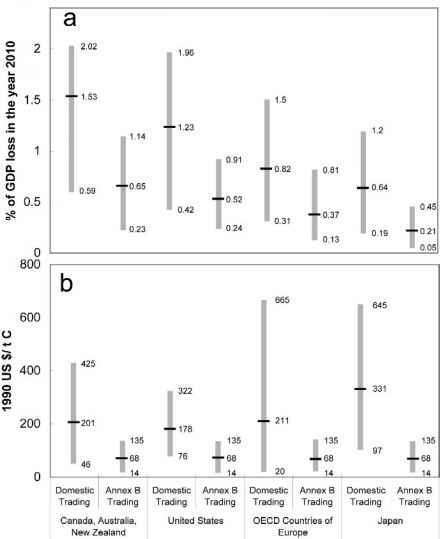 Cost estimates based on bottom-up analyses for biological mitigation vary significantly, from US$0.1/t C to about US$20/t C in several tropical countries and from US$20/t C to US $100/t C in nontropical countries. The cost calculations are subject to the same caveats that were noted for the energy sector. In contrast to the relatively low estimates of costs and large opportunity for potential emissions reductions in the near term from bottom-up analyses, models of the global economy provide a generally more pessimistic picture of the costs. Costs in these models are reported in terms of the change (loss) of GDP in a future year, say 2010, or in terms of carbon taxes measured in U.S. dollars per ton of carbon that would be required to achieve a given reduction. Global modeling studies show national marginal costs to meet the Kyoto targets for each group of countries in Figure 22.2 to range from about US$20/tC up to US$600/tC without trading, and from about US$15/tC up to US$150/tC with Annex B trading.3 In the absence of Annex B trading, losses range from 0.2 to 2 percent of GDP.4 With Annex B trading, losses range from 0.1 to 1 percent of GDP. The range of results both within and across regions is caused, in large part, by varying assumptions about future GDP growth rates, carbon intensity, and energy intensity. The cost reductions from Annex B trading may depend on the details of implementation, including the compatibility of domestic and international mechanisms, and constraints on emissions trading. How might one reconcile the bottom-up, technology-specific estimates that indicate low positive or even negative costs, and the higher and only positive costs from models of the global economy? One issue that would reduce the cost differential relates to the lack of a baseline in the technology estimates. Recall that the bottom-up estimates reported are not differences from a baseline scenario but from a 1990 base-year valuation. It is conceivable that some fraction of the negative or low-cost options would be absorbed in a bottom-up baseline scenario, thus leaving only the higher-cost options for a mitigation scenario. In global models, the low- or negative-cost options are assumed to be absorbed in the baseline and only positive costs remain. Using a common baseline would reduce the cost differential considerably. market. Barriers such as high cost of capital, lack of information, misplaced incentives, network externalities, ill-defined property rights, market power, and others can prevent firms from entering the market or slow their entry (Sathaye et al. 2001). Overcoming such barriers adds to the cost of market entry and creates a disincentive to rapid and steady implementation of mitigation options. How much might it cost to overcome such barriers? What are the magnitudes of transaction costs? How do these change as a market evolves from nascent to more mature? Answering these questions requires further empirical research. Figure 22.1 shows the historical changes in carbon emissions and GDP per capita. It is worth asking whether these historical changes in rates would be adequate to achieve stabilization of carbon dioxide concentration by 2100. Changes in carbon emissions of an economy may be expressed in terms of changes in two contributing factors: the energy and carbon intensities of the economy. Figure 22.3 shows how these two factors change from 2000 to 2100 in several IPCC mitigation scenarios. The figure also shows the range of historical changes. Historical rates of change in energy intensity are consistent with those needed for future stabilization of carbon dioxide concentrations, but those for carbon intensity are far slower. In other words, the mitigation scenarios include a more rapid shift away from carbon-intensive to less- or non-carbon-intensive forms of energy than has been achieved historically. Would it be possible to achieve such a change in carbon intensity? This may be entirely possible, because the global energy mix will almost certainly change during the 21st century in response to limited proven conventional oil and gas reserves and conventional oil resources. The choice of energy mix and associated technologies and investments—toward more exploitation of unconventional oil and gas resources, exploitation of non-fossil energy sources, or use of fossil energy technology with carbon capture and storage—provides an opportunity for a shift toward the increased use of less-carbon-intensive fuels. Figure 22.3. Rate of change in (a) energy intensity, and (b) carbon intensity, historically achieved levels (1860—1990). Based on data provided by Dr. Igor Bashmakov, Russian Center for Energy Efficiency, Moscow, in consultation with the late Prof. Tsuneyuki Morita, National Institute for Environmental Studies, Japan. lock-in to early versions of rapidly developing low-emission technology. On the other hand, more rapid near-term action would decrease environmental and human risks and the associated costs of projected changes in climate, and may stimulate more rapid deployment of existing low-emission technologies and provide strong near-term incentives to future technological changes. The costs of stabilizing carbon dioxide concentrations in the atmosphere increase as the concentration stabilization level declines (Watson et al. 2001). Different baselines can have a strong influence on absolute costs. While there is a moderate increase in the costs in shifting from a 750 ppm to a 550 ppm concentration stabilization level, there is a larger increase in shifting from 550 ppm to 450 ppm, unless the emissions in the baseline scenario are very low. In no case do the stabilization scenarios lead to significant declines in global GDP growth rates over this century. The losses, however, vary across regions and time. These studies do not incorporate carbon sequestration or noncarbon dioxide gases and did not examine the possible effect of more ambitious targets on induced technological change. Plans for implementing climate change mitigation options will need to carefully consider the distributional impact on the affected stakeholders. As already noted, mitigation will aim at increasing the share of low- or non-carbon fuels and technologies, reduction of technologies that emit non-CO2 GHGs, reduction of deforestation, and the increase of forest and other biomass cover and soil carbon. The obvious losers will be those that are associated with the supply and use of coal, and to a lesser extent oil, and deforesting countries whose forests would need to be conserved. Within a country, not surprisingly, the impact of a carbon tax is likely to be felt primarily by carbon-intensive producers, such as those who use coal. The number of studies that have identified such sectoral impacts, however, is relatively small. One such study, Clean Energy Futures for the US, shows, for instance, that a US$100/t C tax results in a 6 percent decline in primary energy use in 2010, representing a 3 percent decline in oil consumption but a 37 percent decline in coal, compared with a business-as-usual scenario (IWG 2000). The consumption of other forms of energy increases from this carbon tax. These impacts also translate into reductions in employment, primarily in the coal but also in the oil industry. Carbon taxes could thus result in uneven distribution of impacts, and, without some form of compensation, the coal and oil industries have a strong disincentive to support a carbon reduction policy. The challenge for building broad support for a carbon tax is further exacerbated by the entrenched status of the losing industries, while the likely winners, industries that might benefit from a carbon tax like the energy efficiency and renewable energy industries, are dispersed and yet to be firmly established. Across countries, the IPCC Third Assessment Report studies show that emission constraints on Annex I (industrialized) countries have varied spillover effects on nonAnnex I (developing) countries. These spillovers include reductions in both projected GDP and oil revenues for oil-exporting, non-Annex I countries. The effects on these countries can be reduced by removal of subsidies for fossil fuels, energy tax restructuring according to carbon content, increased use of natural gas, and diversification of the economies of non-Annex I, oil-exporting countries. Other non-Annex I countries (developing non-OPEC [Organization of Petroleum Exporting] countries) may be adversely affected by reductions in demand for their exports to OECD countries and by price increases of those carbon-intensive and other products they continue to import. These other non—Annex I countries may benefit from the reduction in fuel prices, increased exports of carbon-intensive products, and the transfer of environmentally sound technologies and know-how. The possible relocation of some carbon-intensive industries to non—Annex I countries and wider impacts on trade flows in response to changing prices may lead to carbon leakage6 on the order of 5-20 percent. The impacts of adaptation options may be categorized as those caused by steady changes in conditions like temperature, precipitation, and sea level and those that are a result of extreme events, including sudden changes in storm surges and extreme weather, for example (Ravindranath and Sathaye 2002). In its Third Assessment Report the IPCC was unable to present much information about economic damage caused by climate change. Both the regional and temporal distribution of impacts continue to be difficult to predict, making it doubly difficult to translate these into economic damage. Sea-level rise is one type of impact that may, however, be amenable to quantification. Increasing global temperatures cause thermal expansion of seawater and the melting of Antarctic and other ice caps, resulting in rising sea levels. The global sea level rose 10 to 20 centimeters (cm) during the 20th century, and IPCC scenarios project it to increase from 9 to 88 cm by 2100, depending on the projected increase of greenhouse gases (Watson et al. 2001). Populations that inhabit small islands and/or low-lying coastal areas are at particular risk of severe social and economic disruptions from sea-level rise and storm surges. A 50-cm rise in global sea level could have significant impacts on U.S. coastal areas (Neumann et al. 2000). Estimates of land inundated are close to 24,000 km2 (9,000 mi2). Major coastal cities such as Miami, New Orleans, and New York will have to upgrade flood defenses and drainage systems or risk adverse consequences. Three options have been proposed for responding to coastal threats: planned retreat, accommodation, and protection. Impact and adaptation assessments evaluate where these responses might be implemented and then calculate the costs of implementation and the damage to resources that are not protected. Generally, property losses or the costs to protect property dominate the existing impact estimates for the United States. Based on a review of the existing literature, Neumann et al. (2000) estimate that cumulative impacts on coastal property of a 50-cm sea-level rise by 2100 range from about US$20 billion to US$150 billion. Similar estimates could be derived for other vulnerable coastal areas to arrive at the cumulative global impact. Such a temporal and global estimate could be taken into consideration in deriving the timing and magnitude of mitigation options. Adaptation options that also serve the purpose of mitigation will lower the cost of stabilizing climate change. Forestry options, such as mangrove forests, can help allevi ate the impacts of sea-level rise while simultaneously mitigating climate change. Planting trees in strategic locations around homes or on rooftops in urban areas will reduce urban temperatures and thus the demand for electricity for space conditioning. The costs of these adaptation/mitigation options need to be examined from the perspective of their dual benefits. 1. The Energy Modeling Forum—21 is currently assessing the impact of including non-CO2 gases and sinks in models of the global economy. 2. These cost estimates are derived using discount rates in the range of 5 to 12 percent, consistent with public sector discount rates. Private internal rates of return vary greatly and are often significantly higher, affecting the rate of adoption of these technologies by private entities. 3. Annex B refers to industrialized countries that have signed on to an emissions target in the Kyoto Protocol. In the hypothetical case of full global emissions trading, marginal cost estimates drop to US$5—90/t C, similar to the positive marginal cost estimates for potential emissions reductions from the bottom-up studies quoted earlier. 4. GDP is an oft-used but incomplete measure of welfare. 5. This fact does not imply that technologies based on as yet unknown materials and/or physical or chemical phenomena will not be developed. Indeed, technological progress is littered with many examples of discoveries that led to significant breakthroughs in improving energy and carbon efficiency. Such discoveries will accelerate the reduction in cost and the time frame over which stabilization may be achieved. 6. "Carbon leakage" refers to an unintended failure to reduce emissions, through shifting them from one location to another or from one sector to another. Brown, S., J. Sathaye, M. Cannell, and P. Kauppi. 1996. Mitigation of carbon emissions to the atmosphere by forest management. Commonwealth Forestry Review 75 (1): 283—338. Fearnside P. 1997. Greenhouse gas emissions from Amazonian hydroelectric reservoirs: The example of Brazil's Tucurui Dam as compared to fossil fuel alternatives. Environmental Conservation 24 (1): 64—75. IWG (Interlaboratory Working Group). 2000. Scenarios for a clean energy future. ORNL/CON-476 and LBNL-44029. Oak Ridge, TN: Oak Ridge National Laboratory, and Berkeley, CA: Lawrence Berkeley National Laboratory. Metz, B., O. Davidson, and R. Swart, eds. 2001. Climate change 2001: Mitigation (Contribution of Working Group III to the Third Assessment Report of the Intergovernmental Panel on Climate Change). Cambridge: Cambridge University Press. Neumann, J. E., G. Yohe, R. Nicholls, and M. Manion. 2000. Sea-level rise and global climate change: A review of impacts to US coasts. Prepared for the Pew Center on Global Climate Change, Washington, DC. Ravindranath, N. H., and J. Sathaye. 2002. Climate change and developing countries. Dordrecht, the Netherlands: Kluwer. Sathaye, J., D. Bouille, D. Biswas, P. Crabbe, L. Geng, D. Hall, H. Imura, A. Jaffe, L.
Michaelis, G. Peszko, A. Verbruggen, E. Worrell, and F. Yamba. 2001. Barriers, opportunities, and market potential of technologies and practices. In Climate change 2001: Mitigation (Contribution ofWorking Group III to the third assessment report of the Intergovernmental Panel on Climate Change), edited by B. Metz, O. Davidson, and R. Swart. Cambridge: Cambridge University Press. Watson, R., I. Noble, B. Bolin, N. Ravindranath, D. Verardo, and D. Dokken, eds. 2000. Land use, land-use change, and forestry (Special report of the Intergovernmental Panel on Climate Change). Cambridge: Cambridge University Press. Watson, R. T., D. Albritton, T. Barker, I. Bashmakov, O. Canziani, R. Christ, U. Cubasch, O. Davidson, H. Gitay, D. Griggs, J. Houghton, J. House, Z. Kundzewicz, M. Lal, N. Leary, C. Magadza, J. McCarthy, J. Mitchell, J. Moreira, M. Munasinghe, I. Noble, R. Pachauri, B. Pittock, M. Prather, R. Richels, J. Robinson, J. Sathaye, S. Schneider, R. Scholes, R. Stocker, N. Sundararaman, R. Swart, T. Taniguchi, and D. Zhou. 2001. Climate change 2001: Synthesis report. Geneva: Intergovernmental Panel on Climate Change.